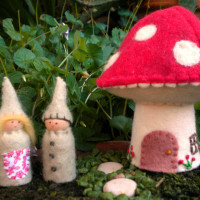 Tiny ceramic gnomes tucked in a soft coloured pouch. Categories: Cute Accessories, Imaginative Play. 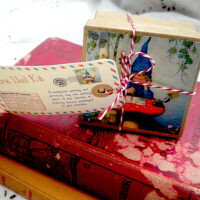 Our tiniest ceramic gnomes come tucked away, safe and sound, in a soft cotton velour pouch. The long cord allows for careful carrying around your neck or hanging somewhere special. An assortment of colours – pink, blue, red, peach and purple. Hand sculptured, glazed and fired, each gnome measures approximately 4-6cm tall. Please feel free to state your colour choice. We will do our best to meet your preferences depending on stock availability.